"Brilliant. If anybody else see's fit they can join once we're unloaded. Only three spots I'm afraid. Horace!" He shouted to his first mate, who strolled over. "I leave her in your very capable hands! Give us the count of thirty to get down, leave the ropes hanging unless anyone else is joining, and have the lookout keep an eye one me. I wait rifles trained at all times, keep the Doctor here covered. Ready my good man?" Longeye asked Madd, who gave a nod. "Right then, off we go!" and he lithely vaulted the rail, plummeting a show way before the cable gently pulled taunt and slowed him. "Let's away, then, Captain." Madd replied, and repelled down, crate in tow. The pair gently lowered into the dust, and it quickly became apparent they would need something to cover their faces. 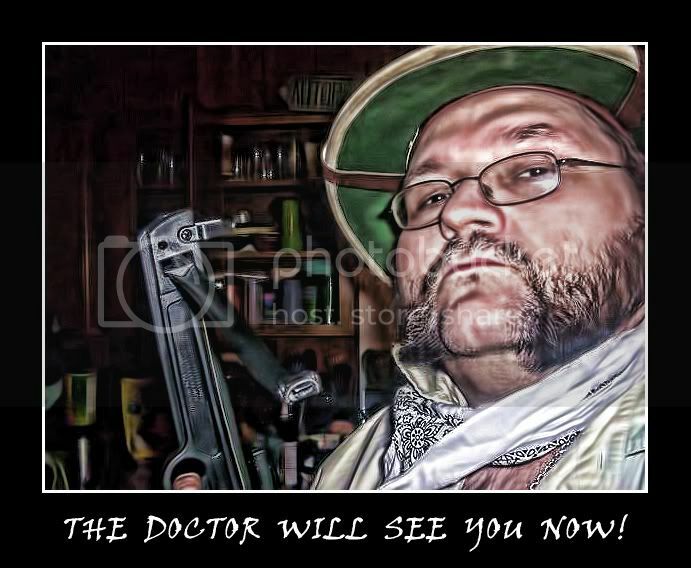 Longeye pulled a strip of cloth from one of hi pockets and bound it over his mouth, before swinging towards the Doctor and giving him a similar strip and a pair of goggles. He slipped a pair on himself, and the two continued. It took exactly 58 seconds to hit the ground, and as a 'count' lasted for two seconds the ropes went lose. Longeye unclipped his and without waiting for the Doctor to get lose he prowled around them, peering into the dust. "Right, you'll know more about this than I, collect some samples... anywhere you want to go?" Madd unharnessed himself and his crate. "Look around for residue," Madd replied, drawing a small knife, a jar and a magnifying glass, "If this was caused by science, there'll be residue from whatever chemical process that caused it.. If it was sorcery.. Well, we'll find out in a minute. .. See if We can catch some of this dust. Whatever is causing it may have particles in the dust. " With that, Madd began scraping up dust from the floor and objects.. "Any idea where we are?" Ethan had simply been an observer this whole time. This was well beyond his expertise or comprehension and he decided he'd be best suited to making sure no trouble makers stumbled upon their little gathering and tried to interrupt the conversation. Unsurprisingly, such a trouble maker did come along. "excuse me sir, I would ask that you avoid this area." of course the man had no interest in avoiding them. To him, they were people he could rob with ease. His thugs soon emerged around him. "we may have a problem gentlemen" he called behind him to where the others were working. Madd smiled beneath his breathing mask. He looked up at the man confronting Corsair. Without a step forward, he set a small bottle on the crate ,and nodded to Ethan. "I'd suggest you gents step away from our colleague, and mind your own business." "My business happens to be in your wallets." he responded with a bullish grin. Ethan took action. He jumped into the air and landed a hefty kick into the skull of what was clearly the leader. He felt as though he was mashing potatoes more thoroughly than the last face-kicker. With the brute on the ground he addressed the others. As the man reeled back, Madd lunged forward, his eyes wild, his mask removed, his teeth bared. The Robber's eyes grew wide as Madd clutched him by the collar and threw him against the wall..
"Don't leave us just yet, sonny jim!.. The Fun's just starting!" With that he clamped his teeth down on the bridge of the man's nose, spraying blood onto the bricks of the alley wall. His agonized scream echoed in the darkness, as Madd's jaws ripped a piece off his nose, blood spattering on the Doctor's khaki shirt. "Rob me will you, you troglodyte!" Madd smashed his forehead into the terrified criminal's bloodied face, " Where I live, thieves get eaten.. You want that?-, you little maggot?!" Madd roared, and snapped his teeth inches from the eye of his victim, " I've a mind to hack off your leg and roast it over a fire! Get inside and off the streets and out of our affairs, because If I have to have this conversation with you again, I will roast you alive and eat you with potatoes and rye bread.. Savvy?" The man shook his head and staggered away with legs quaking.. Madd wiped the blood off his mouth with a hankerchief and was as calm as before. Longeye watched this fairly impassively. He'd seen worse, and he knew the benefit of 'dirty fighting' lay in the fact you could almost definitely fight again afterwards. The criminals were running off, but there was a flash from one as he turned, a pistol in his hand. He took aim at the doctor and pulled the trigger. What happened next was confusing, there was a bang and a loud "ting", then the shooter slowly toppled over and lay still. After Madd and Ethan saw this, they looked around and found Longeye was suddenly in front of Madd, his staff levelled with a bullet hole in the ground, and a gun in his hand smocking still. "Carry on there chaps" he said dismissively, and stepped away slightly. "I think if you follow the curve of this rubble-" he indicated what could have been a bank at once point, "there will be something at the end of it. Excellent work there though, I've never seen someone so... at easy with fighting. " "Thank you." Madd said, as he picked up some small fibers with a pair of tweezers. "Think we should follow them?" "I think if we did we might have to kill them all. I've no problem, but the 'Moth can't' follow us in this. I'd hoped we'd have some guns to back us up, but they can see slightly less than we can in this dust." "Ah, We've scared them enough." Madd replied as he calmly knelt over the dead man , A sharp khukri in hand, severing the head. "Let's follow the rubble, and figure this out. You'll have to pardon me.. The Jungle, I'm afraid, has not helped my manners." "No no, by all means. As long as you don't plan on doing anything with it on the ship." Longeye wandered along the rubble, checking for anything out of the ordinary. It looked just like a demolition site, except a badly maintained one. There were rocks, and rubble, but it was strewn across the floor and there were bits of wall hanging from their original anchors. "Take a look at the wall, and see if you can find some residue." Madd handed Ethan and The Captain some jars and small scrapers. "If we find any residue, we can check it for explosives or chemicals." Tucking the head into a bag, Madd turned to Longeye..."That should shrink nicely." Longeye nodded absent mindedly, and took the jars. He scraped up some dust and gently tapped a portion of brick off before continuing. He had walked about a hundred meters, the Doctor and Ethan in tow, before he found one of the rocks. It was huge, at least thirty meters across and sitting in a crater around another twenty meter ring of debris. It was entirely unremarkable, simply a rock. No symbols on it, no marks of any kind, and no sign of any sort of chemical. He stepped forward to get some scrapings form it, but before he could get near it; it radiated energy. The whole area was lit up, the dust becoming a white wall. Longeye felt the masses of energy it help disperse quickly through the air, and not having any magic of his own it simply rolled over him. "Whoa What?" Madd said, a little taken back by the stone and its activity. "It's just... dumping energy. I don't know much about magic, but I know that certain things can and can't hold it. Gems are very good at holding it, rock isn't. It CAN hold it, but not for long and it's harder to put it in to begin with. This is serious energy, I've never seen anything with this much power, and God knows how much it took to put it here." " I wonder..." Madd spoke softly, as he reached into his belt for a small geologist's hammer and a chisel...But he too was thrown back by the power. "We need somebody to vent this if we want to get close. It could release like this for days on its own. Or it could last an hour, I really have no idea." "Do you know anyone?" Madd replied, as he looked about the alley. "Well Yarrow is a mage, a damned good one by the look of it, so he could be able to. I don't know where he's gone though, we'd have to go back to the ship and find him again- HEY YOU!" Longeye yelled, pointing to a few people who were creeping towards the rock. As soon as he yelled they gave a start and ran back into the dust. There was, as before, a blinding flash, a peal of thunder, and the splash of nearly-plasmic flame upon the cobbles; as if summoned by the mention of his name, Yarrow stepped out of the mass of flame and heat, the Cloak of Fire, if anything, more intense than it had been the night before. The reason became immediately apparent, when a hail of arrows and stones that had begun to shower down toward the trio who were already at the site of the crater was incinerated by the Transportive Firebolt; the few that got through fell down around and on Yarrow, but were deflected by the field that emanated from the cloak. "I'd suggest that you stay back from those stones, Gentlemen. A sample from them is not actually needed. Just let me get within the edge of the crater, if you will." His form suddenly melted and reformed yet again; it had taken a lot of energy to cast the Transportive Firebolt, manifest himself out of it, and deflect the crowd's imprecations, all within the first several instants of his arrival; the strain and the drain on his reserves had apparently taken its toll and brought on teh change sooner than expected. the cloak seemed to waver; Yarrow grunted and seemed to make an effort of control, and then huis features contorted into an indignant snarl as he flung his arm out behind himself and blasted three cudgel-bearing thugs off of their feet, and sent their erstwhile supporters fleeing in terror. "I AM A SPARKHUNTER, You Fools," he thundered, his voice amplified by a simple cantrip. BE GONE!" The thugs woke up, gave every facial indication of having wet themselves, and took to their heels yelling in fright. Yarrow took the aforementioned compass from a pocket in his cloak, set it up on the edge of the crater, and began to chant, his voice taking on an unearthly basso tone. The needle swung around in large arcs, then a beam of light shot off to one side, then another, and then a thick beam shot from the device, indicating that the direction of origin was off to the Northeast. Longeye did jump at the teleportation. He liked to think he was unflappable, but he hadn't seen magic that strong for many many years. He didn't really notice the shield, it was a common mage trick to protect themselves with a variety of enchantments and shields both in and out of the colleges. The Locator, though, was new. To his knowledge noting like it was working anywhere else in England, and England had the most advanced magic by far. "Vent away my good man, just point it that way-" he pointed to roughly where the sun would be "So you don't hit the 'Moth!" Madd watched this, and eyed the cudgel-waving fools with contempt. Cities , as Madd saw it, were fenced pens where people herded inside it like sheep. They stayed inside their pens and only existed until their shepherds had no further use for them. The predatory gazes he saw were from the criminal element. "Civilization.." He spat under his breath.